After five years as a lonelysentinel in space, an American spacecraft that has already crossed paths withone small comet is about to visit another icy wanderer: Comet Hartley 2. The spacecraft inquestion is Deep Impact, a NASA probe launched in 2005 that visited the CometTempel 1 on July 4 of that year and smacked the comet with an impactor vehicle tokick up material and see what it was made of. Astronomers used telescopesin space and on Earth to watch the DeepImpact's comet collision, and now they're ramping up again for thespacecraft's flyby of Comet Hartley 2. The comet flyby occursThursday (Nov. 4) at about 10:01 a.m. EDT (1401 GMT). But Deep Impact's new cometrendezvous ? which NASA calls EPOXI ? won't be noticeable to Earth-basedobservers when the spacecraft makes its closest approach to Hartley 2. Unlike in 2005, when DeepImpact's impactor raised a cloud of dust from the nucleus of Tempel 1, no suchaudacious maneuver is planned during its flyby of CometHartley 2. As a result, ground based observers will see no changes in theappearance of the comet and besides, the spacecraft itself is far too small tobe seen using ground based telescopes. Comet Hartley 2 was notNASA's first choice for Deep Impact's second comet rendezvous. Mission scientistsoriginally planned for a December 2008 flyby of Comet Boethin and on July 21,2005 the Deep Impact probe fired its thrusters in a maneuver that allowed it touse Earth's gravity to begin a new mission in a path toward Comet Boethin. But soon scientists wasrealized that there was a problem. Astronomers could not findComet Boethin in surveys and suspect that it apparently fragmented into myriad tinyparticles. This meant rewriting a new game plan for Deep Impact. 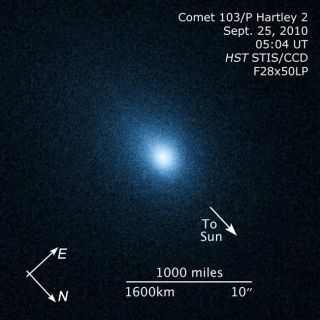 A new target was selected:Comet 103P/Hartley 2. To reach this new comet,however, would require an extra two years of travel for the spacecraft. On May28 of this year, the spacecraft fired its thrusters in a correction burn sentit whipping past the Earth on June 27 to use our planet?s gravity to aim itselfon a course for a flybyof Comet Hartley 2. ?? CometHartley 2 is a relatively small comet with orbital period of about 6.46 years.It was discovered by Malcolm Hartley in 1986 at the Schmidt Telescope Unit inSiding Spring, Australia. UnlikeComet Boethin, Hartley 2 has been well observed by both amateur andprofessional astronomers in the weeks and months leading up to its encounter bythe Deep Impact spacecraft. Thecomet passed within 11.2 million miles of Earth (about 45 times the distance tothe moon) on Oct. 20.? Last week, the comet arrived at perihelion ? its closestapproach to the sun ? at a distance of 97.6 million miles (157 million km) fromthe star.? It is now moving away from both the sun and Earth. ?This spacecraft, and mission team, have logged 3.2 billion milesover the past five years, and we are confident that we have a successful planin place to give Hartley 2 a thorough look-see," said Tim Larson, projectmanager for NASA's EPOXI mission at Jet Propulsion Laboratory in Pasadena, Calif.
Amateurastronomers have been tracking Comet Hartley 2 in recent weeks with binocularsand small telescopes. It has appeared mainly as a dim, circular patch of light. Observationsby the Hubble Space Telescope have also helped plan Thursday?s flyby of thecomet. The observation campaign has been a tantalizing tease of things tocome and provided EPOXI?s science team the best extended view of a comet inhistory during its pass through the inner solar system. The Hubble observationswill continue through the encounter phase of the mission. Thelatest observations of Hartley 2 shows that the comet's nucleus, its core ofice and rock, has a diameter of approximately just under a mile (1.5 km), whichis consistent with previous estimates. Barringan unforeseen breakup (like what happened to Comet Boethin), Hartley 2 shouldbe able to survive up to another 100 circuits through the solar system (about 700years) at its current rate of mass loss. Havingpassed closest to the sun on Oct. 28, Comet Hartley 2 is now is in its mostactive state. Deep Impact isclosing in on Comet Hartley 2 at a rate of 7.8 miles ?per second (12.5 kps). On Nov. 4 atabout 10:01 a.m. EDT (1401 GMT), the spacecraft will make its closest approachto the comet at a distance of about 434 miles (700 km). ?It will be onlythe fifth time that a comet has been photographed up close and the first timein history that one spacecraft has observed two different comets with the sameset of instruments. The mission?sencounter phase begins late Wednesday (Nov. 3), when the spacecraft is about 18hours from the time of closest approach to the comet?s nucleus. At that time thespacecraft will stop transmitting through its large high-gain antenna andreorient itself so its two visible-light and one infrared imager maintain lockon the comet for the next 24 hours or so.? At that point,the spacecraft will begin beaming down its cache of comet close-ups whilecontinuing to take new images. It is expected to take several hours for all theimages aboard Deep Impact to be beamed back to Earth. Comets seem to resemblefrozen froth left over from the tempestuous birth of the solar system some 4.5billion years ago. Astronomers think the interiors of comets havechanged little since then and contain pristine ice, gases, dust and othermaterials from the solar system's formation. But their true nature is probablymore perplexing than that of any other object within the gravitational grip ofthe sun.? So scientists believe that understandingcomets is a way of understanding how the solar system was born.? Another reason to studycomets is that they can pose a threat of colliding with Earth, just like asteroids,and have the potential to cause cataclysmic damage.? Defending against suchpossibilities requires knowing more about these objects in hopes of possiblydeflecting or even destroying objects those that might potentially cross pathswith our planet.